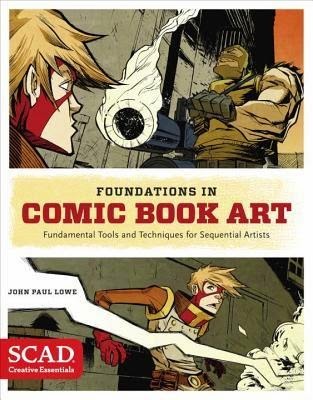 A comprehensive guide to creating and developing comic book and graphic novel art, from the Savannah College of Art and Design (SCAD), one of the world's leaders in sequential arts instruction. Artists seeking a way to break into the exciting world of sequential art first need to master the tools, techniques, and habits used by their favorite pencillers, inkers, and digital artists for creating dynamic, exciting comic artwork. In Foundations for Comic Book Art, the Savannah College of Art and Design (SCAD)—a leading force in art and design education—enlists one of its top instructors, John Paul Lowe, to provide aspiring comic book makers with a thorough primer for creative comics, featuring must-know concepts like contour drawing, mastering perspective, using photo-reference, and adding digital patterns. Examples from the works of SCAD faculty, alumni, and students are paired with Lowe’s easy-to-follow, step-by-step lessons and exercises for readers, demonstrating the vital processes all would-be sequential artists have to know before joining the ranks of the comic book–making elite. As soon as this book came out of the envelope, there was a mad grab for it by my thirteen year old. He's really the only one of us who has any amount of artistic ability (at least when it comes to drawing) and as he flipped through the pages, I could tell that he would be coming back to this book many, many times. When I had a chance to read through it, I was especially taken with the fact that the author appreciates individuality and leads the reader through the book in a series of chapter leading from easiest to most difficult. So long as you don't skip ahead, anyone with artistic drawing ability should be able to follow along and certainly to learn. I know that I learned a lot and while I had a very solid appreciation for what my artist friends do when they work on comics, this just cemented just how awesome that they are. If you have any interest in comic book art, becoming a comic book artist, improving your own artwork or just want to flip through a book with some amazing work in it, written by someone who is down to earth, pick up this book. It's another that I'm suggesting for the holiday gift giving season.